So after 250-something days of working on this, I've figured it's time to open it up for a bit of testing. It's still very new - there's not much content or graphics implemented, but it's generally quite moddable in regards to the data. 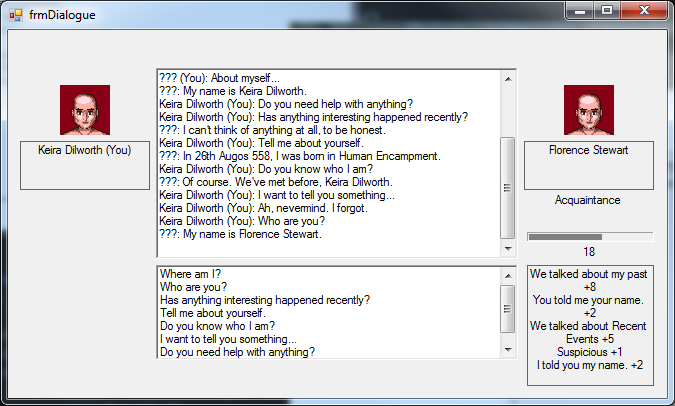 Project Keira is, well in Bay12 terms and on summary, Adventure Mode of Dwarf Fortress. It's form-based on VB.Net and just a hobby-project of mine. I'd love to get some feedback from Bay12 on it - especially the modding side of it, I'm not sure what the data files are capable of just yet. To quote a description from another forum I posted on, here's the Introduction, really. Anyway, you can download the latest version here. Edit; Random screenshot from earlier test-play. A pool of Dwarven Ale. Looks really cool! Really hope you make good on this project. Thanks man! I've been passionate about the idea behind this game since 2009, you've probably seen a couple of failed attempts historically from myself on DF, but this one's been going on in development since just after Christmas last year, so I'm pretty happy with its sustainability.